Hey, everybody else has a blog now, so here's mine. Collecting Tattoos. I'm also the keeper of the rec.arts.bodyart Tattoo Frequently Asked Questions list. I also have a database of tattoo artist reviews, so you can look for a good artist in your area. Bicycling. I used to be racer, but now I just ride to work and for fun. On weekends I ride with the Foothill Cycle Club. For historical interest, here's a picture of me with the Claremont Colleges cycling team at the 1978 Southern California Collegiate Championship. I also have photo album of racing pictures. And if you're curious, I've written down some of my bike racing stories. I'm particularly interested in the history of the local Urban Legend that claims that a conspiracy of General Motors and other assorted malefactors killed off rail mass transit in Los Angeles. I have a brief write-up about this legend, along with links to more information on it here. I'm the webmaster and nerd-in-residence of 1134.org, which is our domain. It comes from our house, which is number 1134. We always liked the number because if you put it into a calculator and turn it upside down, it spells 'hEll'. I'm a lapsed science nerd. My degree is in physics, but after graduation I decided to take some time off from school. At my first job at McDonnell Douglas I had to do some programming involving computer graphics. While watching a graph being drawn on one of our HP 2640 terminals, I said, "Hmmm. I wonder how that works..." and the die was cast. I became a computer nerd. And yes, that is my vanity license plate. I got it back in 1984. I went to the L.A. car show that year, and the DMV had a booth there with the plate books. 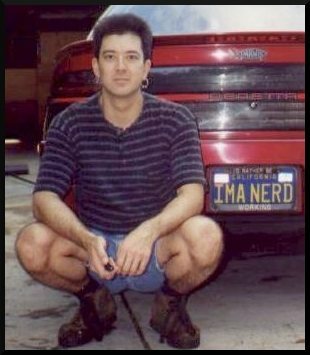 In those days, if you wanted a personalized license plate, you had to look through several big phone-book-sized books to see if your plate was already taken. Now you can look it up online. In any event, I looked through the books. "NERD" was already taken, so I went for my second choice, and there you have it. Oddly enough, I only score 50 on the Nerdity Test. By trade, I'm a system administrator for the U.S. Geological Survey at the Pasadena Field Office. Our office is part of the Earthquake Hazards Program, which makes my job very much of an 'Only-In-L.A.' type of thing. It's great fun, and in fact, it's the most fun I've ever had at work. And no, we don't know when the Big One is going to happen. But you can subscribe to our Earthquake Notification Service to find out the details after it happens. The system sends automatic email notification of earthquakes worldwide, and the mail is sent within five to fifteen minutes of a significant earthquake. So if you subscribe, you can know about about it pretty soon after it happens. If you're really bored, this is my resume.